Are you sick of salads yet? I hope not! There are so many ways to dress up greens and make them interesting! I generally add some kind of cheese, some kind of nuts, fruit, and various other veggies, then top them with balsamic vinegar and olive oil. 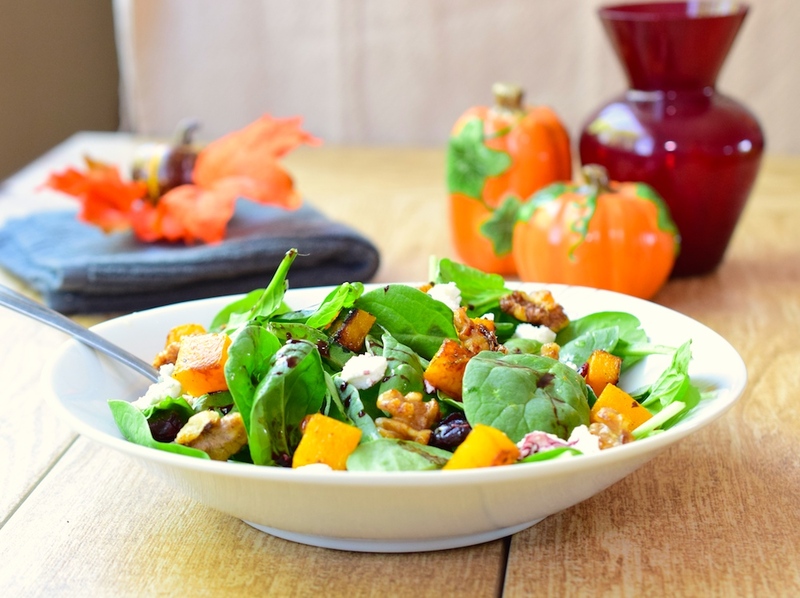 This Baby Spinach and Butternut Squash Salad is full of the flavors of Fall, and you can easily turn it into a a whole meal. Just add your favorite protein and a gluten free ciabatta loaf (Canyon Bakehouse has a really yummy one, or you can use Pamela’s gluten free bread roll mix ), and you’ll leave the table full and satisfied! Just make sure to keep the bread intake low, because bread is not low carb. 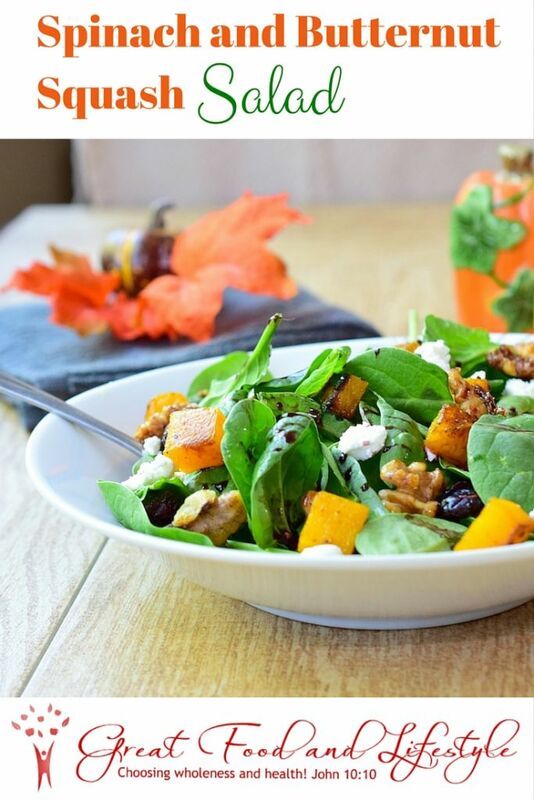 Butternut Squash and baby spinach together are a powerhouse of nutrition. Both are high in antioxidants and fiber. Orange veggies are known for their high Vitamin A content, which becomes more bioavailable when you gently cook it. Spinach and other green leafy veggies should be eaten at least once a day! These greens help pretty much every system in your body. Note: I’ve included this salad in my “Paleo” category. Many people do not consider dairy to be true to the caveman style of eating. Many, however, do, so it’s really up to you. I figure my diet is already so restricted, being low carb and gluten free, that I don’t mind adding some dairy. 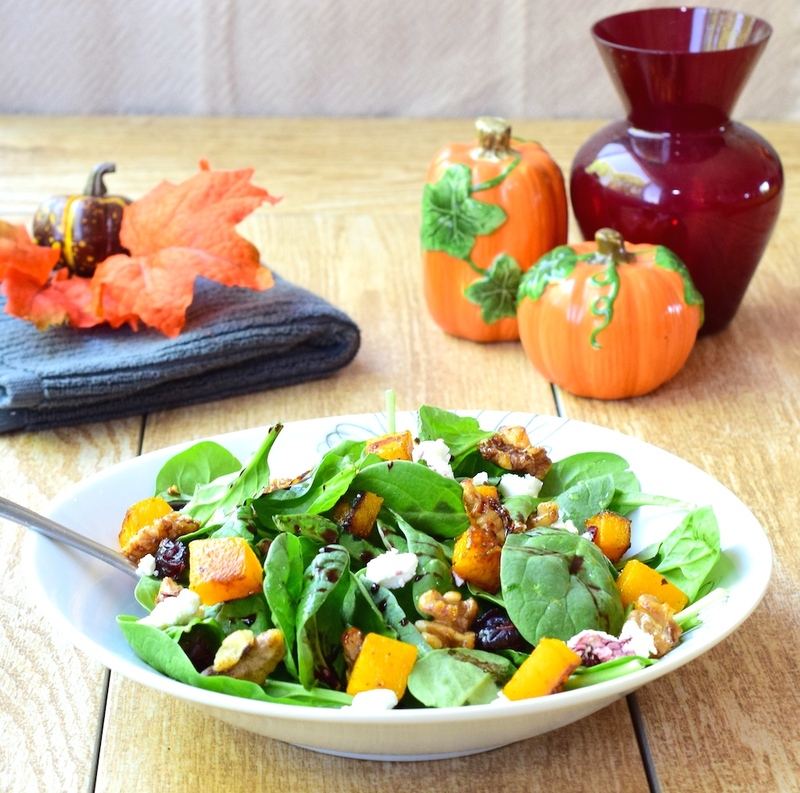 Before we get to the recipe for the Spinach and Butternut Squash Salad, I want to invite you to join with others who are making healthy changes. I’d love to walk alongside you in your journey towards wholeness and health! Jesus said, “I have come that they may have life, and have it to the full!” Freedom from food addictions is part of having a truly full life. Start by preparing your candied walnuts and butternut squash. Click on the ingredient link above for instructions on the walnuts. Heat the coconut oil in a large pan over medium heat. Cook the butternut squash until it is soft and light brown. Sprinkle it with sea salt, and set it aside to cool. Once the walnuts and squash are cool, assemble the salad in a large bowl, finishing it off with the oil, vinegar, pepper, and more sea salt. Serve cold. Enjoy! Note: Skip the cheese to make this salad vegan.